Our roots are in fine dining. Chef Nick Gardner shares his passion and worldwide experience from Hatted and Michelin starred restaurants through his unique and creative cuisine. Ingrained in us is attentive service, a commitment to quality and a passion for what we serve. Combine these qualities with a love for good food that is good for us, a fantastic location in the heart of Kangaroo Valley and a commitment to our environment and we bring you Hampden Deli. We source the finest local, fresh and seasonal ingredients. We pickle, ferment, brine, cook, knead, bake and serve naturally the best housemade deli produce we can. 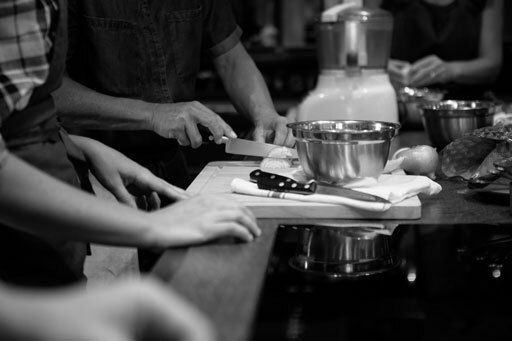 Want to learn the chef secrets from behind the walls of the kitchen? Join our hatted chefs for a cooking class to enhance or finesse your kitchen skills. Our hatted chefs will never lose their enthusiasm to cook beautifully plated dishes. Weekly changing dining events await you. At Hampden Deli, we are constantly changing our classes. We offer skill based favourites such as bread making, charcuterie and handmade canapes. Come get motivated with new dinner party menu ideas and Stevie’s favourite- last minute pastries!